The prospect of McLaren running a full-on orange livery for 2018 got me thinking about how certain F1 teams are associated with a specific colour, i.e. for most people, if you think of a red F1 car, you'll immediately think of one team. That made me curious as to the following: what one team first comes to mind when you think of the following colours? I've tried to keep these quite broad as if we start going into different types of blue, for example, we could end up with dozens of different colours! Incidentally, as I'm sure there must be some people on here who are colourblind and might not really be able to answer all of the above (I've genuinely no idea if that is the case or not, so please pardon my ignorance) I was wondering how does that actually impact the way you watch F1? Do you find some liveries end up looking really similar? Yes, I am an old-timer. I think I got stuck on a 90s theme. I remembered seeing a God awful brown Lotus when looking for Lotus 49 pics once but couldn't remember who ran it but after some quick Googling it was Team Rebaque apparently in 1978 with a Lotus 79 but it didn't exactly spring to mind without some searching so might not count as well as the others. The 1979 brown one with a bit more sponsors looked ok though to be fair. I thought of Jordan *and* Forti before Renault which is all the more hilarious because I love the Renault livery. Funny thing is, I didn't even think of their black livery first, although I attribute that more to the fact that when I was young, I had a little toy version of the Sauber C13, so in my head that's my go-to black F1 car. I'm putting it down to a mixture of the Buzzin' and Hornets which I loved and maybe a bit of what bradtheboywonder says about Blue and Alonso's cars kind of blocking the Renault=Yellow thinking part of my brain,lol. That Sauber was nice yeah. I thought of Arrows because their all black 'Danka' car from the late 90's was a big favourite as are just about all of Arrows liveries from that period. Last edited by Lotus49 on Sat Feb 17, 2018 10:18 pm, edited 1 time in total. Brown: I've got nothing on this one. Are you going to compile any data so we can see how wide or tight the spread were on these? Jordan popped in to my head for both yellow and orange, but I don't think they've ever even ran orange (I probably had a sh*t TV), so I've left orange blank. I still think Silver when I think McLaren, although I mostly think of those big 'West' sidepods which was the white & black livery, so I'm learning my brain is a weird thing. True. I realised, however, a lot of people mentioned Arrows before me, serves me right for not reading properly! Last edited by mcdo on Tue Feb 20, 2018 2:03 pm, edited 1 time in total. Not for me it doesn't - I never saw a blue Tyrell or a green Lotus on TV, and they're still the associations I have for those colors. Arrows must have the most varied colour associations of any team? All but 7 I think which is pretty good going. And we've got gold+black,black,red+white,blue+red,blue+white and black and orange amongst others. Just the very first one that came to mind here. Brown: ... can't bring to mind one I would consider actually brown as opposed to off-white or gold or basically black. Yea it's funny because when I first became aware of F1 Lotus was using the JPS livery but I associate green with them instead of Jaguar despite being a Jaguar fan(in general, not necessarily F1) and drew a blank wit associating black with any one team. Yeah, the green Lotus livery was before my time, and in the time I have been watching F1 (1990 onwards) the green liveries that really stand out are Jaguar and Caterham (who of course used the Lotus name). Yet due to watching old F1 races, seeing classic F1 cars at events etc., that's what team I associate it most strongly with. I also wonder how many of my own answers would be changed at the end of 2018 if one team adopted a new colour scheme for this season. For example, if Red Bull's launch livery was actually kept on, would I finish 2018 associating blue with Red Bull simply because it was at the very forefront of my mind. 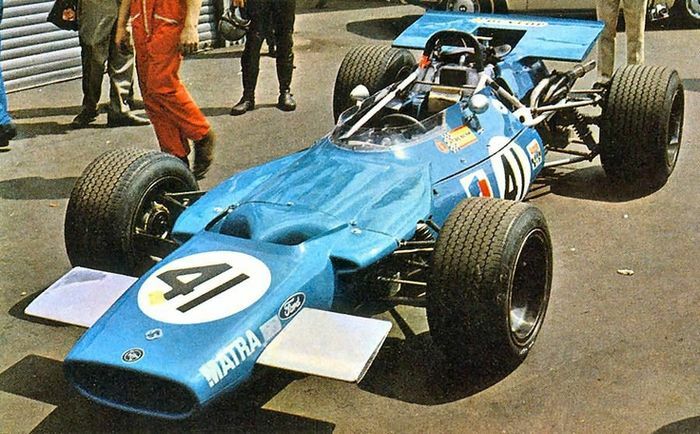 It's good so see that some of you remember Matra. Their blue cars were stunning, if not always fast. Can't believe nobody has mentioned Spyker yet for Orange.. Probably because Spyker (and Midland) were utterly, utterly forgettable incarnations of the team while it transformed from Jordan into what is (the team formally known as? haha) Force India. Lola F1 takes all the colours from everyone else I think you'll find!